For the Solve menu > Report & Update Activities > Show activity changes for report we’ve added the filter option created or modified. For the iPhone (mobile application) we’ve added support for the Constant Contact, Zendesk, and Freshbooks activities. Based on feedback and questions we’ve refined the Google Calendar Sync options panel to make the options clearer & simpler to understand. … and we’ve released the highly anticipated Google Task sync feature for testing. The option is located under: Solve Menu > Report & Update Activities > Show next actions assigned to > Data > Synchronize events and tasks with Google. Google Apps accounts > Settings > Manage this domain > SolveCRM > Update permissions. 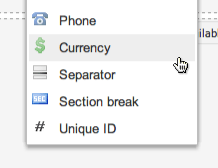 Standard Gmail accounts: On the Solve sync options panel click the “remove this connection” then re-grant access. Google Apps document merge script now supports field substitution in the document Header and Footer. When re-editing a scheduled email the signature is now only inserted once. The scheduled email “open” date now reflects the first time the recipient opened the message and not the last. The item forms now show a label “[itemType} details” so it’s clearer what type of record you’re working on. For the iPhone (mobile app) the linked-emails activity now loaded after displaying the contact details making it a bit faster to get going.